(By ISOUTHAMERICA Staff) - The Iguazu Falls are one of the main travel attractions in South America with 1.2 million visitors a year. This official Natural Wonder of The World it located in a tri-border region between Argentina, Brazil and Paraguay. Usually to visit all sights travelers has to jump from a country to an other many times during their stay. We know that sometimes this could be stressful, having to stamp their passport recurrently. Depending of the nationality of the passenger, he might have to show a VISA to enter Brazil. Book with us and enjoy a stress free international cross border service. We offer pick up at IGR and IGU airports and private ground transportation to all Hotels in Foz do Iguaçu (Brazil), Puerto Iguazu (Argentina) and Ciudad del Este (Paraguay). Transfers to/from Iguazu Falls National Parks also available. 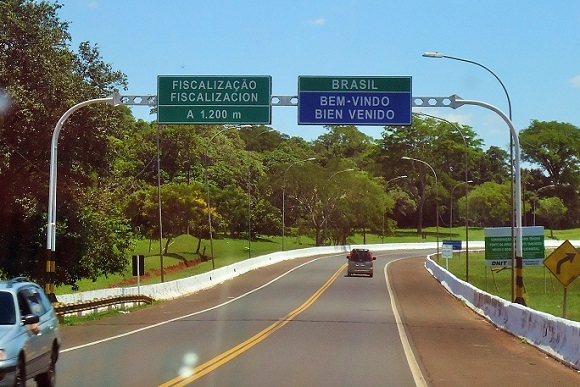 Picture taken by one our customers while entering Brazilian soil at Iguazu Falls border (with Argentina).